No Chain & Vacant Possession - This delightfully detached two bedroom bungalow situated in the grounds of Leawood Hall. The property enjoys a peaceful location surrounded by the hall gardens. Comprising of: A spacious lounge with multi fuel stove, dining kitchen and conservatory, two good sized bedrooms, master en-suite shower room and family bathroom. There is ample off road parking and a delightful courtyard garden with patio and seating area. Benefits include double glazing and Propane gas central heating. The Haven is located within walking distance of Holloway village, the birthplace of Florence Nightingale. A picturesque village nestling in the Derbyshire hills surrounded by open countryside with many fine walks and a wealth of history. Conveniently situated for the towns of Matlock and Belper and within easy commuting distance of Nottingham and Derby. Nearby railway stations at Cromford and Matlock. Set on the outskirts of the popular village of Holloway being a conservation area and having close ties to the Nightingale family, in particular Florence Nightingale. Offering a variety of local independent amenities such as shop, butchers, schooling and alike together with ready access to neighbouring village and town facilities within Crich, Cromford and Matlock with commuter links further afield. From Matlock Crown Square, take the A6 south as signposted Derby proceeding through the village of Matlock Bath and into Cromford. At the traffic light crossroads turn left into Mill Road and continuing onto Lea Road for approximately 1½ miles before rising up Mill Lane where the property can be found on the right hand side identified by the Agent's For Sale board. 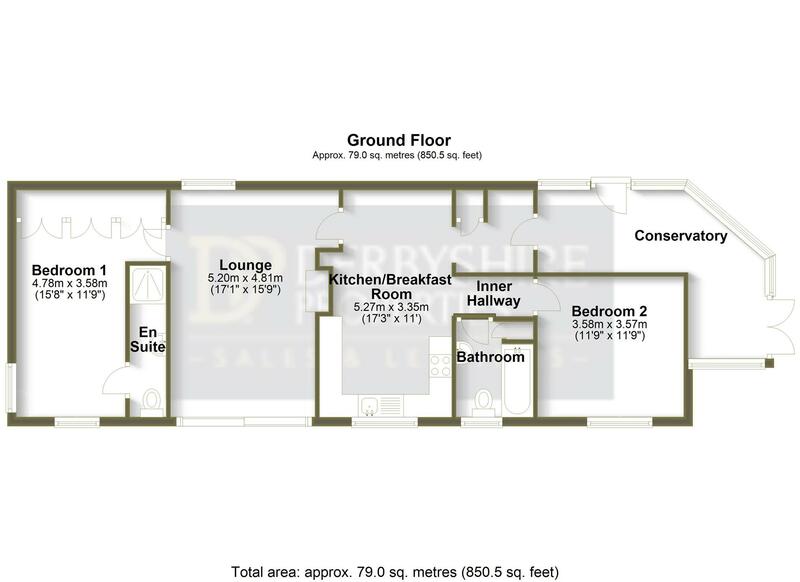 The property is approached via a half glazed entrance door which opens into the L-shaped uPVC double glazed conservatory, 10' 1" x 4' 11" (3.07m x 1.50m) and 14' 10" x 6' 6" (4.52m x 1.98m), with brick built low wall, ceramic tiled floor, polycarbonate apexed roof with centre light and fan, double glazed doors opening onto the decked area of the courtyard garden and a uPVC double glazed panel door with privacy glazing opening into the entrance hall. 7' 2" x 6' 3" (2.18m x 1.91m) Having a storage unit with display shelving and drawers, a coat hanging cupboard, central heating radiator and door to dining kitchen. 17' 3" x 11' (5.26m x 3.35m) max, with uPVC double glazed leaded windows to the front and rear elevations, a range of wall and base units incorporating drawers, open display shelving, wine rack, rolled edge work surfaces over incorporating an inset stainless steel double bowl sink and drainer with mixer tap, tiled splashbacks, inset four ring electric halogen hob with stainless steel air extractor canopy over and double oven, built-in cupboard housing the Worcester central heating boiler, space for under work surface fridge and freezer, concealed space and plumbing for washing machine, central heating radiators, telephone point, retractable loft access ladder to the partially boarded loft fitted with lighting and space for a family dining table. 17' 1" x 15' 9" (5.21m x 4.80m) with a uPVC double glazed and leaded window to the front elevation, central heating radiator, feature cast iron inset multi-fuel stove on a tiled hearth, television point, telephone point and sliding patio doors to the rear having open views of 'The Hall' gardens, fields and wooded hillsides beyond. 15' 8" x 11' 9" (4.78m x 3.58m) with a uPVC double glazed leaded windows to two elevations, fitted light wood effect wardrobes having hanging rail and shelf storage with panelled and mirrored doors, matching drawer unit, central heating radiators. 11' 2" x 2' 7" (3.40m x 0.79m) with shower cubicle having a electric shower, pedestal wash hand basin and close-couple dual flush WC, central heating radiator, electrically heated towel rail, low voltage spot down-lights and air extractor fan. 11' 9" x 9' 11" (3.58m x 3.02m) has uPVC double glazed leaded windows to two elevations, one having garden views, television point and central heating radiator. 7' 4" x 7' 1" (2.24m x 2.16m) Fitted with a three piece suite comprising panelled bath with Triton electric shower over, glass shower screen, low level WC, pedestal wash hand basin, partial tiling, central heating radiator, built-in storage cupboard and uPVC double glazed leaded window with privacy glazing. The property is approached via a 'The Hall' driveway, turning left immediately after 'The Lodge' and sweeping round to the property having a block paved private parking area with a secluded flagged patio area to the side surrounded by mature trees. At the other end of the bungalow is a courtyard garden enclosed by stone walls and fencing having a decked seating area by the conservatory, raised well stocked borders and a water feature, garden store, log store and a path across the rear of the bungalow, where there is an outside water tap, to the patio doors opening to the sitting room.